The location of Alma Cemetery and the main feature located there (Devil’s Chair) seems to be a widely disputed issue at some online sources. We’ve tried to condense the location information we’ve found online to help people find it more easily. Alma Cemetery is located in Waubansee County at the intersection of Cedar Point Road and the Old K18 Road. West 5th Street in Alma turns into the Old K18 Road as one drives west out of the town. The GPS coordinates for Alma Cemetery are 39.016N and -96.298W. The Alma Cemetery is apparently known as the St. John’s Cemetery now. It is located west of Alma, Kansas on Cedar Point Road. There are, according to some reports, two cemeteries, one on one side of the road and another on the other side of the road. Online maps do not depict two cemeteries on either side of the road. However, “roots web” a website dedicated to genealogical information contained at cemeteries claims that Alma Cemetery is “3, 3, 3 cemeteries in 1!” According to our resource, the cemetery on the WEST side of the road supposedly is the one of interest. Indeed, Alma Cemetery, otherwise reported to be “St. John’s Cemetery” is on the west side of Cedar Point Road. Driving North on Cedar Point Road, it will turn to the right. Stop before this turn and get out of the car. Walk back to the south along the road and you’ll see a path located about “halfway from where the treeline stops”. About 7 feet into the trees, you’ll see the Devil’s Chair. Go up Cedar Point Road until you hit the curve. It’s in the bushes. It’s located near the back of the cemetery, near the woods. Alma, Kansas, a community of less than 1,000 people, is located in the Flint Hills. It is the Waubansee County Seat. Alma was established by the Swedes, English, Irish, and the Germans in the late 1850’s. Many of the folks living there today are descendants of those first settlers in the region. The Pottowatamie tribe lived in the area of Alma, Kansas prior to its settlement by European American’s in 1858. 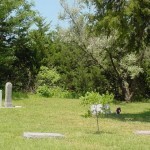 Alma Cemetery has burials dating back to the mid-1800’s listed at Rootsweb. The Devil’s Chair is a well with a couple of boards over the top of it. There is apparently a hole in the boards covering this well. According to local lore, a farmer once owned the land where The Devil’s Chair is located. In the early history of the city, leaders wanted to purchase his land, but he refused to sell it. One day, he was mysteriously pushed into the well. City leaders found him there when they became aware of a foul stench coming from the well. The well became known as The Devil’s Chair following this incident, according to Alma locals. Claims have been made the people who have dared to sit on the Devil’s Chair have disappeared suddenly and mysteriously.